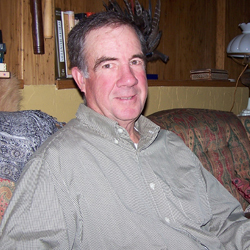 Carl Chesick has been keeping bees without treatments or medications since his first season in 2003. He and his wife operate Green Goddess Farm, a thirteen acre organically managed farm in West Asheville. The apiary provides honey, propolis tincture, candles and clean beeswax cosmetics. 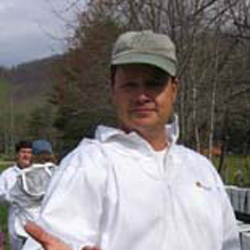 In addition to belonging to the Buncombe County (Asheville) Chapter of NCSBA (http://www.wncbees.org), Carl is Executive Director of the WNC Center for Honeybee Research (http://www.honeybeeresearch.org) a 501 C (3) non-profit formed to further honeybee education and conduct honeybee research. Stuart Van Meter is former President of the Henderson County (Hendersonville) chapter of the NC state association (http://hcbeekeepers.com) He is a long-time beekeeper who manages about fifty colonies in several yards between Mills River and Hendersonville and farms full-time at his Gommin Acres Farm atop Davis Mountain. Stuart carries his interest in breeding stronger stocks of bees wherever he goes - even to the point of visiting 'Africanized Honey Bees' on a vacation to Oaxca Mexico!